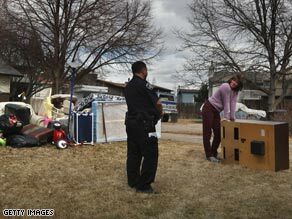 A deputy oversees an eviction in Lafayette, Colorado, last week. WASHINGTON (CNN) - A new national poll indicates that nearly three out of four Americans are scared about the way things are going in the country today. Seventy-three percent of those questioned in a CNN/Opinion Research Corporation survey released Monday say they're very or somewhat scared about the way things are going in the United States. That's six points higher than in an October poll. Nearly eight in 10 say things are going badly in the country, with just 21 percent suggesting that things are going well. The survey also says that three out of four Americans are angry about the way things are going in the country. But three out of four questioned say that things are going well for them personally. The poll was released a day before President Barack Obama gives a prime-time address before a joint session of Congress. "Americans always believe things are better in their own lives than in the rest of the country," said CNN Polling Director Keating Holland. "But they are realists as well - they recognize that bad times somewhere else in the U.S. may eventually come to affect them. That's why so many say they are angry and scared, even though they're content with their own personal circumstances." is more optimistic - call them a little less pessimistic at best." The CNN/Opinion Research Corporation poll was conducted Wednesday and Thursday, with 1,046 adults questioned by telephone. The survey's sampling error is plus or minus 3 percentage points.